We had a bit of a health crisis here today. Last night Henry (the cat you never see in our photos because he absolutely HATES construction sounds) suddenly began leaking urine, which is not good under any circumstance but especially bad for a cat, I'm sure you will all agree. He and I spent a good part of the day today with the vet, then I spent the rest of the day cleaning up last night's pee-fest. Good fun. Hey! Let's look outside at the garden! It's all pretty out there now! 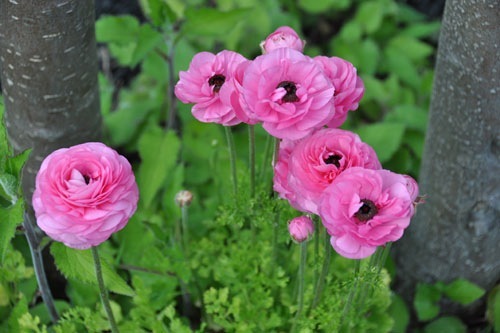 One of my favourites, the ranunculus. I really should get more of them. I guess I don't because I got the corms at a big box store, and I hardly ever bother even going into the big stores. However, they do sell ranunculus in other places. They're a pretty reliable performer, and I love the flowers. 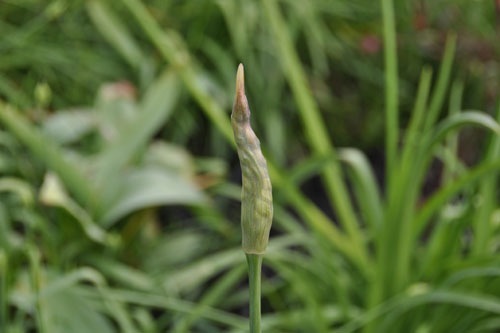 Another old reliable is the allium. Most of the alliums out front have been weeded out. I expect some will come back on their own; there were a LOT of bulbs there and I'm sure many were too crowded to do anything visible. If not, they are cheap and fun and they thrive in this climate. Also, somehow I forget some of the spring bulbs every year. Like these Allium bulgaricum, which I planted ages ago. They come back reliably and are very decorative and weird (I have made a note to buy more of them this year). And they are always a surprise, because by the time they show up I've forgotten I ever planted them. Some of the show in the garden is potential. 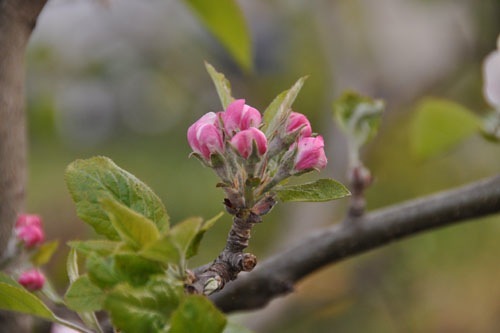 I actually think the apple buds here look prettier than the (somewhat plain) blossoms in full bloom. This year I need to get out there and thin the apples after fruit set, rather than just let them get big and awkward. If you don't thin them, bugs nest in between the fruits and make a mess. Ice plant is kind of notorious around here as a cheap highway planting. That's because the larger varieties cover quickly and to stabilize the ground a little. They're also really pretty in bloom, some of them achingly so. 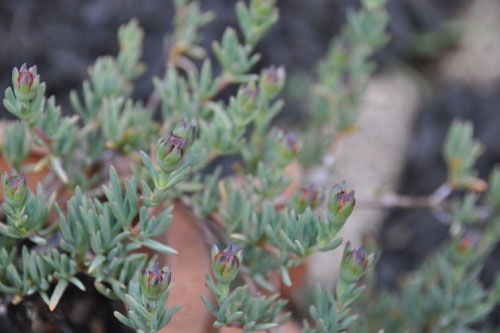 This miniature spreading succulent is Lampranthus "Hot Flash," and I've finally gotten the requirements down to get it to bloom. Growing things like this in a container can be a little tricky. And I need to consult the gardeners about the wisteria. I've handled wisteria before, but only one that was already well trained. Which this one is not. It's not technically our vine, but like our Cecile Brunner it has a strong relationship with the fence and ends up being a feature on both sides of the fence. This year all the wisteria buds appeared on our side. Talking over the fence with our neighbor she expressed regret that it was not blooming, so we took some of the branches on our side and draped them over the fence again. There has to be a better way to deal with that. 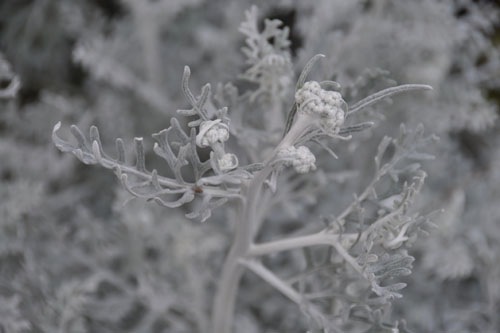 Among the many plants I don't understand, we have Dusty Miller. This plants LOVES this garden. I mean, it gets HUGE every year, blooms like mad, and tries to overtake everything in its sights. I moved it last year which only set it back a tiny bit. It is very decorative, but it stands out and looks slightly awkward everywhere I put it. Maybe as we develop the planting beds, it will grow up and turn into something interesting. Speaking of growing up and turning into something interesting, I took the chicks out in the yard for a little exploration. Once again, they did not want to get off my arm. 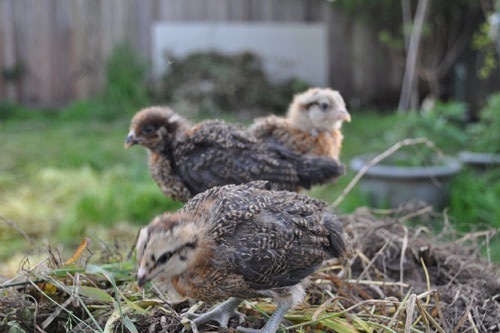 But they do eventually have to learn to like the ground, so I made them, and soon they were pecking and poking and nearly falling off the compost pile I set them on. This weekend is Annie's Annuals' big spring party, so I spent much of the week with sketches and plans and garden catalogs. Hopefully I won't spent the whole day tomorrow at the vet's office again. What is wrong with Henry? I've had several cats, but that's a symptom I haven't heard of. Hope he is well soon. 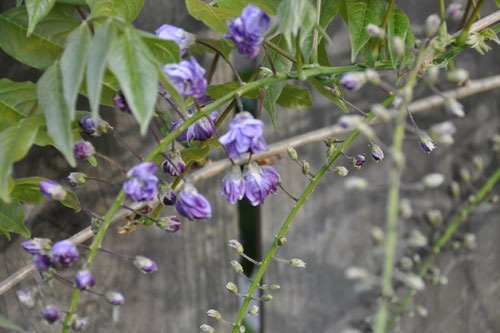 Wisteria flowers develop in buds near the base of the previous year's growth, so pruning back side shoots to the basal few buds in early spring can enhance the visibility of the flowers. 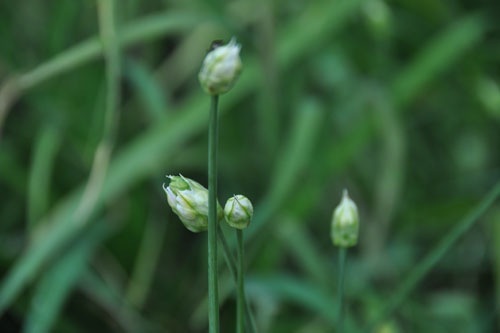 If it is desired to control the size of the plant, the side shoots can be shortened to between 20 and 40 cm long in mid summer, and back to 10 to 20 cm in the fall. Henry has a very enlarged bladder and some kind of infection somewhere (lots of white blood cells in all his tests). He was unable to make himself pee, which is very unusual, so he was just kind of leaking from overflow. We did an x-ray and there were no blockages or signs of anything obvious causing a problem. If it persists we'll do an ultrasound to take a look at an area of dense tissue around his urethra, but when he's squeezed, pee comes out. The vet expressed his bladder to relieve it, and he's on a medication that should help his bladder muscle do its job. Right now we're watching and waiting, because nobody concerned (me or the two vets) has ever seen anything like this in a cat. So far so good; he's been a good patient and is doing pretty well. I'm sorry to hear that Henry is feeling poorly. I hope he gets better soon and that you don't have any more cat pee to clean up. Those ranunculus are so pretty. I like the lacy foliage too.